 The Website is operated by GeekMechanics.co.uk (“We” or "GM"). Please visit the Contact Us page on this website for our contact details. We may collect any information you submit via any online forms or other interactive areas that appear on our Website from time to time. This includes information contained in any enquiry, quote or Feedback you post on the Website or which is contained in any message you transmit via this Website. We may collect information about you if you contact us offline, for example by telephone, fax, email or post. We may collect information about your usage of our Website. Your information will be used to provide you with access to our Website and to supply you with any information or services you request. In particular: If you are a driver and enquire for a quote on our Website we will use pass your details to our Mechanics who are best placed to respond and we will send details of the Job, together with your first name, to these selected Mechanics so they can respond. Any Mechanics who respond to your Job will also be given access to your telephone number so that they can contact you to discuss your requirements and their quotation. If you are a driver and post Feedback, the content of the Feedback will be published on our Website. If you register with us as a Driver or Mechanic and have consented to receive such information, we may use your details to provide you with, or permit selected third parties to provide you with, information about goods, services and offers we feel may interest you. If you register with us we may use your information to contact you for feedback on your use or our products, services or our Website. We may also use and analyse the information we collect so that we can administer, support, improve and develop our Website and the products and services we offer. We will share your information with other users of the Website in the ways described in section 3 above. We may share your information with another organisation which buys our business or our assets or to whom we transfer our agreement with you and in the course of any negotiations which may or may not lead to such a transfer or sale. We may pass aggregate information about the usage of our Website to third parties but this will not include information that can be used to identify you. We will disclose your information if we are required to by law. We may disclose your information to enforcement authorities if they ask us to, or to a third party in the context of actual or threatened legal proceedings, provided we can do so without breaching data protection laws. Unless permitted or required to do so by law, we will not otherwise share, sell or distribute any of the information you provide to us without your consent. Cookies are small text files which are transferred from our Website and stored on your computer's hard drive. They enable our Website to “remember” who you are. By enquiring to use our Website you are consenting to us using cookies in the ways described in our Cookies policy. You may be able to configure your browser to restrict cookies or block all cookies if you wish. However, if you disable cookies you may find this adversely affects your ability to use certain parts of this Website. You have the right to see any information we hold about you on payment of a statutory fee, which is currently £10. You have the right to correct any errors in information we hold about you. Please inform us about changes to your details so that we can keep our records accurate and up to date. You have the right to opt out of receiving any marketing material from us or any third party at any time.